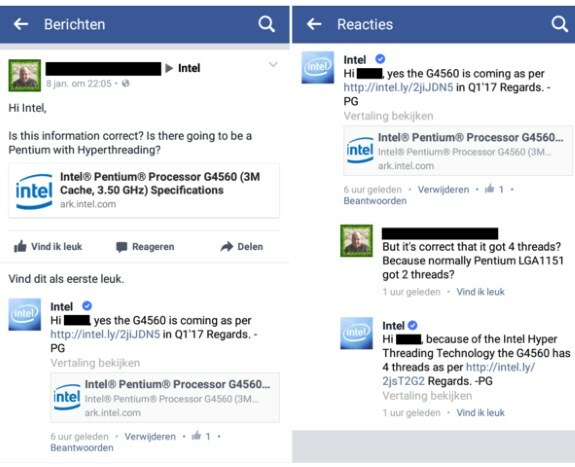 Dutch tech site Hardware.Info reports Intel has finally added Hyper-Threading support on its Kaby Lake-based Pentium processors. Previously, this feature was not available on Intel's low-end processors but the new Pentium G4560, G4560T, G4600, G4600T and G4620 are all dual-core processors with four threads. Besides lower clockspeeds, the only difference versus the Core i3 CPUs seems to be the lack of support for the AVX2 instruction set, which offers higher performance in database and video editing applications.